This is the best half-ton pickup truck for you if… Well, no ifs, no qualifiers. The redesigned 2019 Ram 1500 from Fiat-Chrysler Automobiles (FCA) is a masterpiece and should be at the very top of your full-size-pickup shopping list. For most of its existence as a truck manufacturer, Chrysler/Dodge/Ram played third fiddle to Ford and General Motors. That started to change when the fourth-generation Dodge Ram 1500 was introduced for the 2009 model year. It led the way when, in 2011, FCA launched Ram as a separate division to market all its light- and heavy-duty trucks and vans. Indeed, that 2009-2018 Ram 1500 represented a paradigm shift: instead of chasing Ford and GM for horsepower, towing, and payload bragging rights, engineers concentrated on comfort and versatility. Innovations such as a coil-link rear suspension, spacious cabs, and available RamBox bedside storage compartments transformed it into a big pickup both exceedingly capable and eminently useable as everyday transportation. The formula worked. Sales grew dramatically during the fourth-generation’s decade-long lifespan. The run continued when the redesigned fifth-generation 2019 Ram hit showrooms in volume in March 2018. Calendar ‘18 became the brand’s best sales year ever and the ceiling is nowhere in sight. While demand for the Ford F-Series and GM’s Chevrolet Silverado and GMC Sierra was essentially flat, FCA sales surged by more than 7 percent, up 42 percent in November 2018 and 34 percent in December. 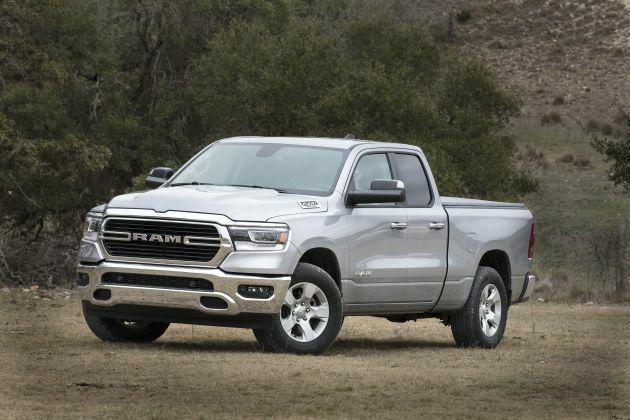 If sales continue at that pace, Ram could overtake the Chevrolet Silverado for second place in the full-size-pickup class by fall 2019. This review is of the fifth-generation Ram 1500. Ram also builds heavier-duty three-quarter-ton-payload 2500- and one-ton 3500-series pickups, although they use a different chassis than the 1500. Note also that as of early 2019, FCA continued to produce limited numbers of fourth-generation Ram 1500s as the Ram Classic, a budget alternative to the redesigned ’19 model. Consider a 2019 because if you’re in the market for a full-size pickup, now is an excellent time to buy. Competition has never been stronger, and every entry is worth consideration. Automakers are offering a heaping helping of purchase incentives to entice buyers. Some, Ram included, are discounting $10,000 or more off the sticker price to qualified buyers. FCA further enhanced this truck’s appeal by launching a multi-function tailgate as an option for certain 2019 Ram 1500 trim levels. Introduced at the 2019 Chicago Auto Show, the tailgate can open and close like a traditional unit. It also has a 60/40 split that allows it to open like the doors on a cargo van. The sections cannot be opened independently, but they extend nearly 90 degrees to run almost parallel to the body sides. Otherwise, the ’20 Ram 1500 should carry over with few changes. Its lineup should reprise base Tradesman, volume-selling Big Horn (Lone Star in Texas), upscale Laramie, off-road-themed Rebel, luxury-trimmed Laramie Longhorn, and flagship Limited. All grades would again offer a Crew Cab body style with four full-size doors and the choice of 5-foot-7- or 6-foot-4-inch cargo beds. All but the Laramie Longhorn and Limited would also have a shorter Quad Cab variant with rear half doors and a 6-foot-4-inch bed. The fifth-generation Ram doesn’t offer a two-door Regular Cab, but you can still get a Ram Classic regular-cab with an 8-foot bed. Styling: Although it’s completely new from the tires up, the exterior design of the 2019 Ram 1500 is evolutionary, and that’s just fine. The silhouette is familiar from the fourth-generation truck, but the front end is tidier yet more muscular, thanks to elimination of the crosshair grille, a relic from Ram’s days as a Dodge truck. Move up the model range and the styling gets more sophisticated; the Limited’s chrome- and satin-finish details would be appropriate for a high-end European sedan. By contrast, the rugged Ram Rebel 1500 is analogous to such off-road-ready rivals as the Chevy Silverado Trail Boss or Toyota Tundra TRD Pro. It rides an inch higher than stock, with firm Bilstein-brand shock absorbers, an available air-spring suspension, specific 18-inch wheels encased in chunky off-road tires, hill-descent control, an electronic locking rear differential, and protective underbody skid plates. In any form, Ram shines for comfort and versatility, its overhauled cabin extends its lead in user experience over any competitor. Main gauges are clear and an available LCD screen between them lets you customize to show a variety of vehicle data. This is not unusual among large pickups, but it’s in the details that Ram stands apart, with carefully crafted shapes and materials, rich upholstery, and premium-car worthy tactility to buttons and dials. Climate system and infotainment offerings range from basic in the Tradesman to thorough in Big Horn, Laramie, and Rebel, to super high-tech in Longhorn and Limited. The standard audio setup’s 5-inch touchscreen is enough to get the job done. Other setups are available with an 8.4-inch display with built-in support for Apple CarPlay and Google Android Auto. The star of the show is the Longhorn and Limited’s optional ultra-high-resolution 12-inch screen; it’s portrait-oriented, just as in a Tesla Model S. The 8.4- and 12-inch systems use Chrysler’s intuitive Uconnect 4 interface with a custom home row that allows you to quickly access preferred functions with a single virtual button press. We’re glad Uconnect’s back-end hardware is quick because we have some issues with the software. From a functionality perspective, you’re compelled to use the touchscreen to control the available heated/ventilated seats and heated steering wheel. Further, on two separate occasions, the Uconnect system in our test Ram crashed, requiring a restart of the vehicle to restore. Also concerning was a squealing as the power running boards deployed and retracted on one of our Limited test vehicles. 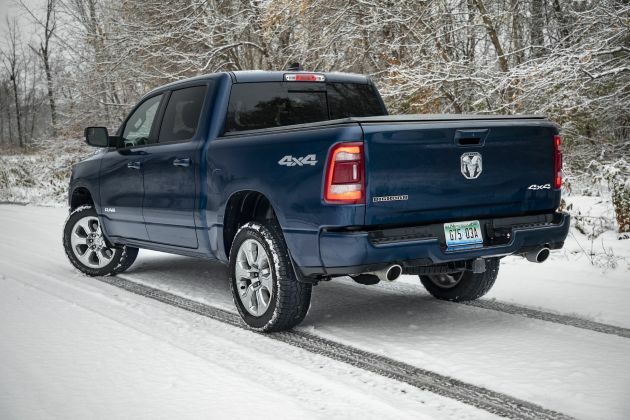 Potential unreliability in the short- or long-term is probably our biggest gripe with the Ram. FCA does not have the best record for dependability, but it’s easy to argue the truck’s excellent comfort and performance far outweigh any risk. Everything else about the 2019 Ram is first rate. The seats are supportive and comfortable. Double Cabs have back-seat accommodations comparable to those of a compact sedan. Crew Cabs are limousine-spacious. Materials quality ranges from hose-it-out durable in the Tradesman and Rebel to designer ranch house in the Laramie Longhorn and Limited. Bountiful in-cabin storage includes two gloveboxes, a large dual-level center console, multitudinous cubbies, and available covered bins beneath the floor in the rear seating area. Traditional USB Type-A and newer Type-C power points provide more than enough connectivity for the driver and passengers alike. FCA has further enhanced the available RamBox storage system, which consists of two covered, weatherproof bins along the cargo-bed walls. Drain holes let you use them as coolers. For 2019, the box can be locked and unlocked via the keyless entry fob, there’s a 115-volt power outlet, and illumination is improved. If you can sacrifice the space it takes away from the open bed, RamBox is so useful we consider it a must-have feature. Another option we’d consider mandatory is the deployable bed step. It’s at the corner of the truck, below the rear bumper, and deploys from a hinge you press with your foot. It’s more elegant than the bumper cutouts on GM’s full-size trucks but not quite as useful as the full-size step you can get on an F-150. Mechanical: Ram’s engineers put the 1500 on a diet. Increased use of high-strength steel and other weight-saving measures mean the 2019 model is up to 225 pounds lighter than its predecessor. Maximum payload capacity of 2,300 pounds and a 12,750-pounds trailer-towing rating are fully competitive with half-ton rivals. Ram’s signature coil-spring rear suspension is improved with new “Frequency Response Damping.” Built into the shock absorbers, the technology is designed to beef-up stability in cornering and under hard braking and improve comfort on rough roads. It works remarkably well, delivering ride quality no competitor can match. Absorption and composure are even better on the Limited, thanks to its standard adaptive air suspension. The suspension also contributes to handling that comes amazingly close to justifying the appellation “agile.” Ram drives like a smaller vehicle, changing direction with very good grip and balance and responding smartly to steering inputs. A tidy-for-the-class 46.2-foot turning radius delivers surprisingly maneuverability in tight quarters. Rear-wheel drive is standard on all but the Rebel. Four-wheel drive (4WD) is included on the Rebel and optional otherwise. The system includes low-range gearing for off-road use. Big Horn/Long Horn and higher grades include an automatic mode that operates like all-wheel drive (AWD) on a crossover SUV. It dynamically apportions power based on traction and road conditions. The other 4WD modes are your typical part-time arrangement that should not be left engaged on dry pavement. Included with the V-6 and optional on the V-8 is FCA’s new “eTorque” system, which adds a 48-volt, 12-cell lithium-ion battery pack that powers a 12-kilowatt generator. The system provides an additional 90 pound-feet of torque on the V-6 and 130 on the V-8. It also allows for engine idle stop/start capability, which can help ave fuel. We evaluated two Hemi-powered 2019 Ram 1500s in Limited trim, one with eTorque and one without. The former offered notably stronger off-the-line and mid-range acceleration thanks to the electric motor’s instantaneous torque. The engine stop/start function was the smoothest we have ever experienced. We hardly noticed shutoffs when idling in traffic, and restarts were free from the shutter and lag that can happen on competing systems, even in the very cold weather we experienced during our test drive of the eTorque model. Speaking of the cold, all models feature a heat exchanger system that assists in getting critical engine fluids up to temperature faster while simultaneously allowing the cabin to warm more quickly, especially when using the available remote engine start. Features: Tradesman grades are meant for fleet and commercial buyers, but they do come standard with air conditioning, 5-inch touchscreen audio system, remote entry, power windows and locks, cruise control, and a tilt and telescopic steering column. Retail shoppers should start at the Big Horn/Lone Star grade, which has aluminum wheels, chrome exterior trim, fog lights, extra USB power points, upgraded upholstery, and in-floor storage bins behind the front seats. Stepping up to the Laramie nets FCA’s Uconnect 4 infotainment system with 8.4-inch touchscreen, upgraded instrument cluster, leather upholstery, heated and ventilated front seats with 12-way power adjustment, heated steering wheel, driver-seat memory positioning, and an Alpine-brand audio system with nine speakers. The Rebel has a higher base price than the Laramie, but most of its standard equipment mirrors that of the Big Horn. It adds full LED exterior lighting, electronic locking rear differential, off-road wheels, tires, and suspension, protective underbody skid plates, front tow hooks, dampened tailgate, power sliding rear window, and 12-way power adjustment for the driver’s seat. Among the luxury grades, Laramie Longhorns include imbedded GPS navigation, 20-inch wheels, upgraded leather seating surfaces, heated rear seats, chrome running boards and authentic wood and metal interior accents. 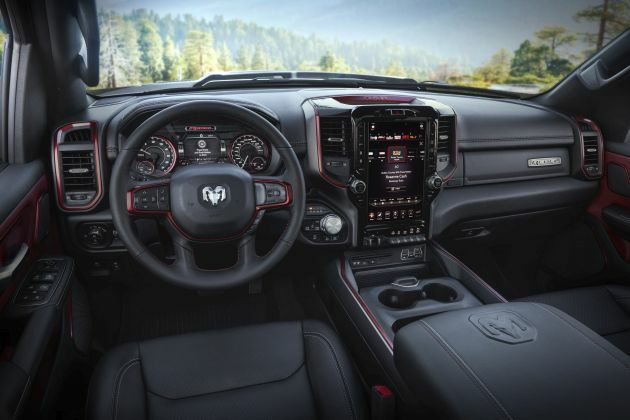 The Limited builds on the Laramie Longhorn by adding the portrait-style, 12-inch infotainment screen, power running boards, blind-spot alert with rear cross-traffic detection, wireless smartphone charging, and an adaptive air suspension. Base prices are aggressive, spanning $33,490 for a rear-wheel drive Quad Cab Tradesman to $58,590 for a 4WD Limited Crew Cab with the 6-foot-4-inch bed. (Base prices here include Ram’s $1,695 destination fee) That said, even the Limited is available with some pricey options that drive its sticker price near its primary Ford and General Motors rivals. Options common to all models include the Hemi V-8 in standard ($1,195) or eTorque ($2,645) form, 4-wheel drive ($3,500), 33-gallon fuel tank ($445), limited-slip differential ($495), deployable bed step ($195), RamBox ($995), a package consisting of four cargo tie-down hooks and spray-on bedliner ($845), and a heavy-duty trailer towing package ($400-$645). A panoramic sunroof is $1,495 and available on all but the Tradesman. The Tradesman’s Level 1 Equipment Group ($1,555) includes interior carpeting with floor mats, power-sliding rear window, and satellite radio. Chrome bumpers, grille, and painted wheels are included on the $995 Chrome Appearance Group. Big Horn/Lone Star have a $1,200 Level 1 Equipment Group with 8.4-inch infotainment screen, trailer-tow package, power driver’s seat, power-adjustable pedals, power sliding rear window, power-folding outside mirrors, and satellite radio. The $2,400 Level 2 Equipment Group includes everything in Level 1 plus additional 115-volt power outlets, 400-watt household power inverter, dampened tailgate, heated front seats, heated steering wheel, extra USB ports, remote engine start, and a CD player. LED exterior lighting is $995. Sport or Black Appearance packages that include unique exterior trim are available for $1,195 and $1,895, respectively. Rebel models offer Level 1 and 2 packages for $2,000 and $3,000, respectively, whose features largely mirror those of the Big Horn. Level 2 is required for the $2,495 Rebel 12 Package, which adds 12-inch touchscreen with imbedded navigation and leather upholstery. Laramie grades also have a Level 1 Equipment Group ($1,695) that includes automatic high-beam headlights, blind-spot alert with rear cross-traffic detection, front- and rear-obstacle detection, rain-sensing windshield wipers, remote tailgate release, and CD player. Its Level 2 Equipment Group ($4,595) includes all this plus a 19-speaker audio system, heated second-row seats, wireless smartphone charging, and imbedded navigation. Level 2 is required to add the $1,695 Advanced Safety Group that includes adaptive radar cruise control, forward-collision warning, autonomous emergency braking, lane-departure warning, hands-free parallel-parking assist, and surround-view camera. A Chrome Appearance Package includes the same items as on the Tradesman and for the same price. Sport and Black Appearance packages are available here as well but cost $2,495 and $3,395, respectively. Laramie Longhorn has a $3,895 Level 1 Equipment Group that includes the items in the Laramie’s Level 2 Group plus power running boards, 12-inch infotainment, and ventilated rear seats. This grade and the Limited, too, offer the Laramie’s $1,695 Advanced Safety Group with the same driver-assistance features. These features are combined on the Limited to form its Level 1 Equipment Group for $2,995. Our budget-buy pick is a Big Horn with the V-6, trailering package, Level 2 Equipment Group, LED lighting, and RamBox for $48,580. A Limited with the eTorque V-8 and Level 1 Group at around $61,830 is a compelling value if you’re shopping on the high end of the market. Standard eTorque makes V-6 Ram 1500s among the most fuel-efficient gasoline-powered full-size trucks. The EPA rates them at 20/25/22 mpg city/highway/combined with rear-wheel drive and 19/24/21 with 4WD. V-8 models without eTorque rate 15/22/17 mpg with rear drive and 15/21/17 with 4WD. Adding eTorque boosts ratings to 17/23/19 with rear drive and 17/22/19 with 4WD. Unfortunately, our V-8-powered test trucks returned disappointing averages of 12.8 mpg in standard form and 12.9 with eTorque. Though to be fair to the latter, much of that evaluation was conducted in sub-freezing winter temperatures. The V-6 uses regular-grade gas. FCA recommends mid-grade 89-octane for the V-8. Since Ram added the multi-function tailgate to the 2019 model, little is liable to change in the near term for this excellent full-size truck. The first major styling or content update for these trucks is unlikely before model-year 2022, at which point it’s possible FCA could divest itself of Ram (and its similarly profitable Jeep division), leaving it at the mercy of a new suitor.